Ayyankali was born in the Pulaya Dalit community of agricultural workers in southern Kerala. Due to his hard work in clearing the jungle, his benevolent landlord gave him a small plot of land for his own use. For a Dalit to own land was very controversial at that time. Ayyankali was a strong youth of 6 ft 6 inches in height but despite his talent was warned not to play with upper caste boys. Ayyankali created his own cultural revolution by staging dramas which protested the oppression of Dalits in Kerala. Like Dalits today, Ayyankali dared to flaunt his manhood by wearing upper caste clothing of a dhoti and turban and daring to ride his bullock cart into the market. When stopped by a group of upper caste thugs he pulled out his long knife and shouted that those who objected to his behavior would see how sharp it was. His courage encouraged other Dalits to dare to throw off the shackles of servility. Ayyankali led a group of these young men down to the village market. When attacked by an upper caste gang this protest became the first armed Dalit struggle in modern Indian history. Inspired by him, other Dalits through southern Kerala, including the capital Trivandrum launched a freedom struggle for civil rights. By 1900, Travancore Dalits had won the right to walk along the public roads. This shows the revolutionary courage of Kerala Dalits. Ayyankali went further and launched the first schools for Dalits with Dalit teachers. Though the first school was destroyed by upper caste thugs, this educational revolution could not be stopped. In 1907 the Travancore government passed an order mandating that all Dalit children be admitted into the schools. Like today the upper caste management of the schools worked to make sure this order never became a reality. Rather than give up Ayyankali launched a mass strike of the Dalit agricultural workers with a list of new demands aside from the right to education. These included the right to job security, the end to victimization (including the filing of false police cases) of workers who asked for their rights, the end of the whipping of workers, and the freedom of movement for Dalits rather than remaining confined in ghettoes. For countless Dalits all over India, Nepal, Pakistan, and Bangladesh, these demands will seem like an impossible dream. But Ayyankali made this dream a reality in southern Kerala. That too, he articulated these social ideas so eloquently despite being illiterate. As the strike went on despite the violence and attempted bribing of workers, Ayyankali was facing the fact that his workers were starving. Brilliantly, he made an agreement with fishermen to allow the Dalits to fish with them. The outraged landlords started setting the homes of worker leaders on fire. Ayyankali responded by a campaign of setting landlord houses on fire. Stricken with fear, never knowing when they might be attacked, the landlords sued for peace. But after this victory, the upper castes announced a reward of Rs 1000 (a hug sum in those days) for anyone who killed Ayyankali. Ayyankali was unbowed and when his bodyguard was arrested, he led a satyagraha at the police station until his bodyguard was released unharmed. For every Dalit community, for every Dalit youth these glowing deeds are crying out to be reincarnated in new freedom struggles. 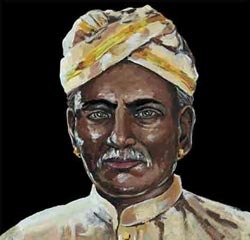 In 1910 when the government decided to implement the Dalit education law, Ayyankali took the first Dalit girl to a school in Balaramapuram with his followers. When attacked by upper caste thugs a full-scale battle took place. In revenge upper caste thugs attacked Dalit huts, molested the women and killed any men who resisted. After seven days of rioting the killing ended but sparks were lit all over southern Kerala. This Pulaya revolution was the first independence struggle in Dalit history. It is part of the glorious legacy of Indian Itihasa but it is not found in so-called history books. In 1912 Ayyankali led Dalits into Nedumangadu markets from which they were banned. The outraged upper castes attacked them and quickly killed the Dalits. Then they surrounded Ayyankali, but his martial arts skills made the professional gangsters run away. In Kazhakkoottam, he was holding a meeting of Dalits when attacked by local upper caste Muslims. Ayyankali and his men fought back until the local police intervened. Ayyankali then went forward and with his colleagues entered the local legislature where they for the first time spoke about the suffering of the Dalits in an Indian legislature and asked for relief from upper caste violence and discrimination in the courts, police and all walks of life and asked for Dalits to be granted the right to hold any position in the government. Despite the suffering he had undergone, Ayyankali was free of malice. Though many Ezhavas (backward castes) had fought with the upper caste in the Pulaya revolution he went to meet the Ezhava spiritual and social reformer Narayana Guru. Despite opposition of some of this genuine guru’s followers a close friendship developed between the two men. Despite Ayyankali’s efforts, Dalit children suffered verbal and physical abuse and severe discrimination from upper caste children in public schools. After more than 60 years of so-called independence this situation has yet to change today. Ayyankali hence started Dalit schools where Dalits could learn in a hate-free environment. He further started magazines to educate the adults. Upper caste resistance exploded into major conflict of Pullattu Rebellion. When three Dalits were admitted to Pullattu school (Thiruvalla District) in 1914, the outraged upper castes boycotted the school and then set it on fire. Ayyankali came and forced them to accept the Dalits. Ayyankali went further and told the local women to stop wearing the traditional slave ornaments of the past and to wear full clothing. The exploitative landlords started whipping workers who dared to wear clothing and who dared to protest the landlords’ sexual exploitation of Dalit women. Dalit youths organized massive resistance with weapons. This movement spread to other parts of Kerala like Kochi. The upper castes hired goondas to put down this movement and to assault Dalit women. Finally the upper castes murdered the local Dalit leader Gopaladasan. On October 24, 1915, a Dalit meeting was held to honour this leader. When these dalits were attacked they exploded and even the Dalit women with sickles in hands attacked the upper castes and set their homes on fire. The upper castes responded by setting the homes of Dalits on fire. The fighting went on for several days. Though a government official, Ayyankali came forward into the middle of this rioting and worked to protect his people without any police help. What Dalit politician has that kind of courage today? Ayyankali tried to make the youth realize that fighting other lower castes was counterproductive but the Dalit youths would not listen to him. Still today Dalits and backward castes kill each other while upper castes rule the roost. Ayyankali investigated the causes and progress of the riot and submitted a report to the government. Ayyankali then organized a meeting of all castes to try and bring peace and justice. In the meeting Ayyankali had the Dalit women take off their stone ornaments symbolic of their slavery and asked the upper castes to accept them as equals. To get justice for Dalits, Ayyankali started his own people’s courts, including a supreme court. This legal revolution is so desperately needed today to stop the endless servitude of the Indian people to the corporate, upper caste legal order. These community courts followed all the procedures of the regular courts and even invited the Dewan to attend. Ayyankali created this parallel legal order despite himself being an illiterate. Ayyankali created organizations to spread his movement into other parts of Kerala. Sadly today there are countless areas throughout India who desperately need today a revolution like the one Ayyankali initiated in Kerala. I am surprised that you have a very good website on the lowest ladder or outside of the Varna system.The untouchables,Harijans or Dalits.It is one of the saddest moments of Indians history that this was created.not able to touch,drink the same water,or walk in the vicinity of upper castes streets,not able to wear shoes,not able to wear a shirt,nearby a upper caste,not able to sit with upper caste in school,class,not able to own land and it goes. This is certainly a psychological slavery,without killing them.The West has been worst in terms of slavery compared to Indians caste system.But this system has to be eradicated.the only was is social revolution.Keep up the good work.i have some doubts of the accuracy of the articles.